Once there might have been a notion of an awards season but these days it seems there is some event or announcement on awards every week. Across such proliferation it is hard for the casual observer to make much sense of what really has been achieved. For the recipients and those in the running it presumably is an important attraction, both for internal motivation and as a way of gaining external recognition and the ensuing promotional advantages. For the organisers it is often a significant commercial venture. The typical format is for a ‘gala dinner’ awards ceremony, complete with celebrity compere and maybe a politician or two. Tickets for the more prestigious such occasions will probably set you back at least £300 per head. A table of ten, therefore, is quite an outlay. While entering awards may be free, there is a sting in the tail if you are short-listed and ‘expected’ to turn up in reasonable force on the night. That inevitably leads to a cynical interpretation that only the companies willing to pay such amounts are going to be in the running, rather than necessarily those with most merit. Short of having sufficient benevolent sponsors to subsidise the whole affair it is hard to see a way round this – and high profile sponsorship can lead to other sorts of bias. Despite these reservations, there is something very appealing about being able to use the term ‘award winning’ in one’s marketing material, especially where it has involved some form of peer endorsement, and by the evidence of the volume of entries it seems there is no slackening of interest in industry awards. 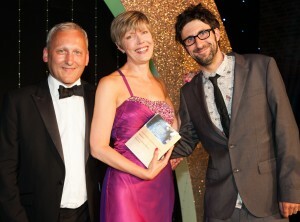 One such is the Business Green Leaders Awards, the latest of which took place on 2 July 2014. I had a privileged insight to this as I had been invited to be part of the judging process. This was a new experience for me and one I found rather reassuring: the quality and range of entries was impressive and so too was the rest of the judging panel. There were twelve of us which meant a lot of tea and cake and also a great spread of perspectives from different disciplines. True we didn’t have very long per category and we only had the entries in front of us to go on – although initial sifting by the organisers had weeded out the poorer stuff and done some basic due diligence – but in most cases we rapidly converged on a top two or three. Splitting these was harder and once or twice revealed the folly of having an even number of judges! Nevertheless, we could all agree in the end that we had picked deserving winners. On the night of the awards I was bowled over by the size of the occasion: some 540 places had been booked, well up from the previous year and clearly this is one awards event that is gathering momentum. I guess the networking potential is another powerful driver for people to attend, whether or not they are up for an award. I also liked the fact there was such a range of winners: companies large and small and doing interestingly different things – comparing them had been a judging challenge but at least nobody was carting off all the prizes and that probably reflects the diversity of the ‘green business industry’. Having used the diversity word I should point out that there is a long way to go to gender parity. It was disappointing that the eight nominees for Business Leader of the Year were all men and more shockingly, when the winners were announced, in many cases it was men only groups that trouped up to the stage to receive their gong. But on a bright note in the three categories for individuals where there was a choice (Entrepreneur; Young Sustainability Executive and Sustainability Executive of the Year), in each case the winner was female.